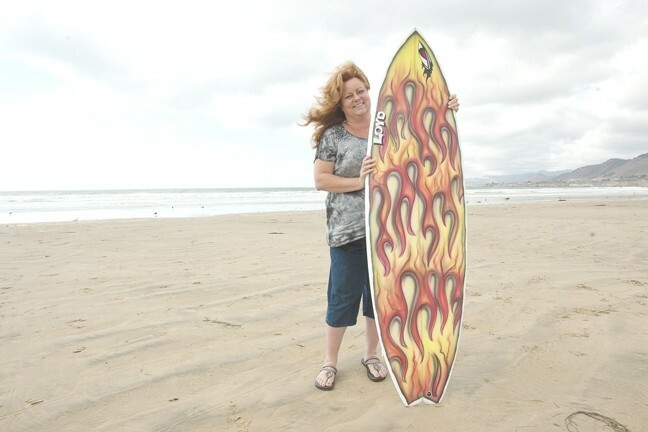 CALIFORNIA GIRL : Teri Bayus, organizer of the Pismo Beach Clam Festival, demonstrates her love for all things relating to beach life. SIP TO SUPPORT: Sip of Paso, a Taste of Talent, runs 2 to 6 p.m. on Oct. 10.BR What better way to spend a beautiful Central Coast Sunday afternoon than listening to original music by local artists, watching dance performances, and noshing on delicious foods and wine? The ninth annual Sip of Paso, which features eight wineries and five talented local chefs, was created to support the North County Dance & Performing Arts Foundation. This event provides much-needed funds for upcoming performances like the 13th annual holiday performance of The Nutcracker, and 2011 spring productions. It also provides students the opportunity to excel in their chosen areas of interest. “We have a special guest this year: Brett Dennen, a very talented guitar player. He opened for Dave Matthews during the past season,” explained Nancy Beckett, co-owner of Peachy Canyon, who founded and organized Sip of Paso. There will be a variety of dance performances throughout the afternoon, including a ballroom dance exhibition. The tasting features some of Paso Robles’ finest wines, with an array of delicious, savory foods and desserts. Among the excellent participating wineries are Chronic Cellars, Clavo, Grey Wolf, Midnight Cellars, Mondo Cellars, Peachy Canyon, Pomar Junction, and Thatcher. The restaurants and caterers include local favorites like Chef Charlie, Dining with Andre, Phil’s Catering, Spice of Life, and Thomas Hill Organics. Besides tasting, you could go home with some great lots featured in the silent and live auctions. Beckett said the lots include food, wine, fine art, and travel packages to bid on. She added: “It’s a great time to think about gift buying for the holidays.” It’s also an opportunity to help keep the arts alive. This event will be held at Rancho Llano de Los Robles, 1535 Nacimiento Lake Drive, Paso Robles. Tickets cost $45 per person, available at classactdance.com, nancytapgirl@yahoo.com, or by calling 431-9235. It was surprising to learn that this year marks the 64th anniversary of the Pismo Beach Clam Festival. I was really happy to learn, however, there are many exciting new events taking place during this year’s event. Pismo’s surfin’ safari offers more treats than ever before. This festival, organized by the Pismo Beach Chamber of Commerce, attracts more than 15,000 people annually for the weekend event taking place Oct. 15 to 17. Besides the Miss Clam competition, downtown parade, games, and surf school, they’ve added delicious treats that are sure to attract every wine and food lover on the Central Coast. You can’t help but be lured by the new tasting attractions: a champagne and caviar tasting, a clam chowder cook-off featuring 10 Pismo Beach restaurants with professional judges (including me) and a people’s choice award, a beer garden on the beach, and a wine walk through many participating Pismo Beach businesses. The foodie additions can be credited to this year’s event coordinator, Teri Bayus, a local restaurant reviewer, who co-owns Mail Plus Pismo Beach. “We amped up the festival to return it to its previous glory as one of the must-attend festivals of the year,” Bayus stated in a press release. Each of these delicious treats requires the purchase of a ticket. But you can save quite a bit of money buying the VIP weekend ticket for $60, which includes the wine walk and commemorative wineglass, beer garden, clam chowder cook-off, champagne and caviar, VIP seating for movies and bandstand, a T-shirt, and a badge. PISMO SHELLS OUT THE FUN: The Pismo Beach Clam Festival runs Oct. 15 to 17. The parade, food and wine events, and games take place at various venues in downtown Pismo Beach. The website, pismobeachclamfestival.com, has the dates, times, and places for every event, game, and surf class, with special hotel packages for out-of-towners. Contact the Pismo Beach Chamber of Commerce at 773-4382, or e-mail questions to clamfestival@pismochamber.com. The wine walk kicks off the festival on Friday night, when several participating businesses will feature a wine tasting station. Each station will be represented by one winery and their expert who can tell you all about the fine wines they’re pouring. The Cracked Crab restaurant will have Wolff Vineyards, and Vino Versato wine shop will feature Core Wine Company. You’ll find one of my local favorites, vintner/winemaker Mike Sinor of Sinor LaVallee, who makes very small amounts of his fabulous wines, at Tastes of the Valleys (TOTV) on Price Street. TOTV owner Ash Mehta said he’ll be offering big discounts on wines-by-the-glass and bottle sales that night. The price for the commemorative wineglass is $5 if you don’t have the VIP badge. On Saturday, 11 a.m. to 4:30 p.m., the beer garden features eight beers on tap from four brands: Coors Light, Sierra Nevada, Negra Modelo, and Pacifico, which sponsored the beer garden. They’ll be serving fresh pretzels and feature a VW car display; tickets cost $25 for one day only. The clam chowder cook-off on Saturday, 11 a.m. to 2 p.m., features 10 restaurants: Cracked Crab, Me & Z’s, Penny’s All American Café, Rosa’s Ristorante, Splash Café, Steamer’s Pismo Beach, and Ventana Grill, among others. The ticket price is only $6 to taste all 10 chowders and vote for the people’s favorite. On Sunday, the beer garden re-opens, and your VIP badge gets you in once more. The badge also gets you into the champagne and caviar tasting. This event, sponsored by Gather Wine Bar owner Kari Ziegler, offers Central Coast bubblies from Arroyo Robles and Laetitia. The sparkling wines, including a non-alcoholic version, and “reverse mimosas” made of sparkling blood orange juice and Pinot Blanc, will be paired with an array of seafood on the raw bar. It will include caviar, oysters, ceviche, sushi, and cooked dishes like steamed clams, plus much more. The individual ticket price is $35. As you can see, the Pismo Beach Clam Festival is a much better value when you buy the weekend VIP badge. Bring a good appetite.